We had an awkward exchange this week with an (unnamed) organisation you might think of as a rival. During my many years as a journalist, it’s always been considered inappropriate to criticise the actions of others in the media. But I believe what happened when MRW reporters sought journalistic access to an upcoming event in the sector is worthy of an airing here. We were told my colleagues could not get in unless they agreed, in every report in our magazine and website, to mention the name of the event and to credit the organisers. We have no problem with the former because the forum for a speech or comment is often relevant to the context. But what does the reader gain from knowing who put on the event? Many journalists report from RWM: should it be mandatory for them to say it is staged by Emap’s sister company i2i? It may be relevant but independent journalists cannot countenance such dictation. We tried to negotiate but in vain. It seemed reasonable to offer something not asked for: links from the MRW website to the event website. It was telling that the final decision about the name-check came from the company’s commercial boss rather than a senior manager charged with protecting editorial standards. I’m aware that journalists do not enjoy a high reputation with the wider public, and one current court case in particular is not helping. 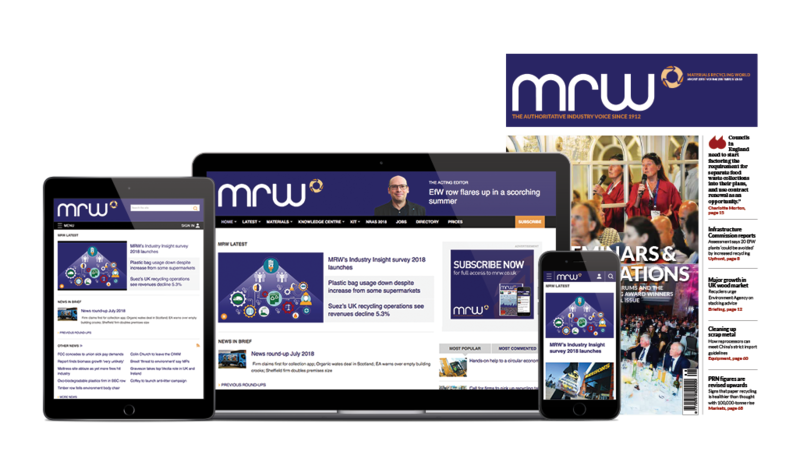 But I need to be confident that MRW’s readers believe our news service is not affected by commercial pressures. We may get things wrong on occasions but such mistakes are for human and not financial reasons. It’s an important principle. After getting that off my chest, there’s just enough space to wish the best to our great set of judges who are kicking off the shortlisting process for the National Recycling Awards in July. I’m proud to report that entries for the 16 categories are up around 30% on last year. Sorry judges!